This image of asteroid Ryugu was taken June 26, 2018, by the Hayabusa2 probe's optical navigation camera, just a day before the probe's rendezvous with the space rock. The image was taken at about 14 miles (22 km) away from the asteroid. The Japanese spacecraft Hayabusa2 has successfully rendezvoused with Ryugu, beginning an 18-month stay at the diamond-shaped asteroid. Launched by the Japan Aerospace Exploration Agency, JAXA, in 2014, the probe will poke, prod and even impact the asteroid, deploying a small lander and three rovers. It will then blast an artificial crater to analyze material below the asteroid's surface. After that, the probe will head back to Earth, arriving near the end of 2020 with samples in tow. "From this point, we are planning to conduct exploratory activities in the vicinity of the asteroid, including [conducting] scientific observation of asteroid Ryugu and surveying the asteroid for sample collection," JAXA officials said in the statement. The Hayabusa2 team will have to select the best place for the probe's lander and rovers based on the space rock's spinning-top-like shape and its rotation; the 3,000-foot-wide (900 meters) asteroid rotates perpendicular to its orbit, completing a full rotation every 7.5 hours. "Now, craters are visible, rocks are visible and the geographical features are seen to vary from place to place. This form of Ryugu is scientifically surprising and also poses a few engineering challenges," Hayabusa2 Project Manager Yuichi Tsuda said in a statement before the asteroid's arrival. The lander on Hayabusa2, called MASCOT(short for Mobile Asteroid Surface Scout), was built by the German Aerospace Center (DLR) as part of a joint German-French contribution to the mission. The lander is scheduled to be released by Hayabusa2 in October. After landing, MASCOT will hop around the asteroid, covering distances of up to 229 feet (70 meters), to study different parts of the asteroid. It is expected to last at least 16 hours, DLR officials have said. "As far as we are concerned, Ryugu is an ideal test object for us, as it is only 900 meters in diameter and there are many members of the same asteroid class in near Earth orbits," Ralf Jaumann of DLR's Institute of Planetary Research in Berlin said in a statement. "Its unusual, angular shape, revealed in the latest images, is exciting." 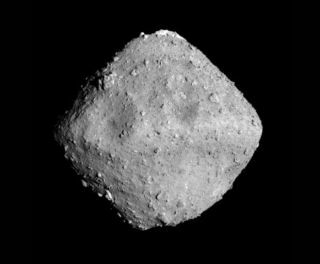 JAXA's first Hayabusa mission brought back dust from the surface of the asteroid Itokawa in 2010; Hayabusa2 will go deeper on Ryugu than the first mission did on Itokawa, blasting the diamond-shaped asteroid with a cannon and spiraling down to collect samples. The estimated cost of the Hayabusa2 mission is 16.4 billion yen ($150 million), according to JAXA.